We are not likely to stop and ponder the things we daily pass by and over, but Julia Fish clearly does. I don’t think it is quite right to say that Julia Fish is the Emily Dickinson of abstraction, but I don’t think it is completely wrong either. For many years now, Fish has been making work based on the incidental details of her house, garden, and studio; while her paintings and drawings may treat a commonplace feature— a square or hexagonal tile — its repetition in her compositions becomes expansive. In 1997 my attention turned to the patterned tiles in the entryway of my home, a floor like so many others, surprisingly common in houses and storefronts built during the early part of this century. And though joined to that history, these small, hand-set tiles delineated and measured a space that had grown particular for me — a place inside, yet not a room— an ordered surface that registered, always, the first step returning and last step away. This statement suggests that the patterned tile signifies transition, the passageway between entering and exiting. We are not likely to stop and ponder the things we daily pass by and over, but Fish clearly does. In 1998, the artist was invited to do something for the Ten in One Gallery, a storefront in the Wicker Park neighborhood of Chicago, the city where she has long been a resident. It was not the gallery’s blank walls but its tiled floor that got her attention. Setting out to restate the tiles in her site-specific installation, Fish prepared her composition by making five works on paper, which have not been exhibited until now: Julia Fish: floret is currently at David Nolan (January 11 – February 18, 2017). The “floret” refers to the patterning of the tiles, each of which is a hexagon, a shape that fascinated the Argentinian writer Jorge Luis Borges and the modernist German architect Peter Behrens. 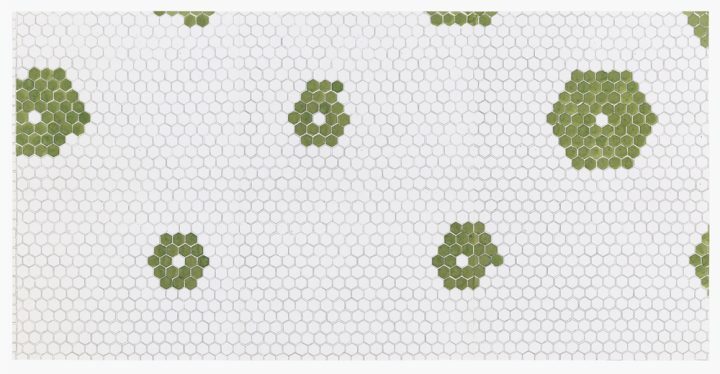 On one hand, the hexagonal tile (or “floret”) is commonplace, but on the other it held symbolic meaning for Borges and Behrens because it is the unit found in every honeycomb. In Borges’ story, “The Library of Babel” (1941), the narrator describes the universe as adjacent hexagonal rooms. Behrens designed the hexagonal logo that appears on the front façade of his AEG Turbine Factory (1909-10). According to the ancient Roman scholar and writer Marcus Terentius Varro, a structure made of hexagons is more compact than one made from squares or equilateral triangles. Unlike the square, it is a geometric unit found in nature. All this has to be taken into account when we consider Fish’s work. For each of the five works she made a laser-printed sheet based on part of the floor. The dimensions of each printed sheet are different, as the artist was mapping the floor by making a one to one correspondence. Knowing Fish to be committed to exactitude, in these carefully cut laser-printed sheets, she is concerned with where the tiles are cut to fit against the wall, and how to take that irregularity into account. In other laser printed sheets, she seems to be ways of incrementally increasing the florets that make up each “flower.” She also seems to be trying to figure out which algorithm she is going to use to make her installation. 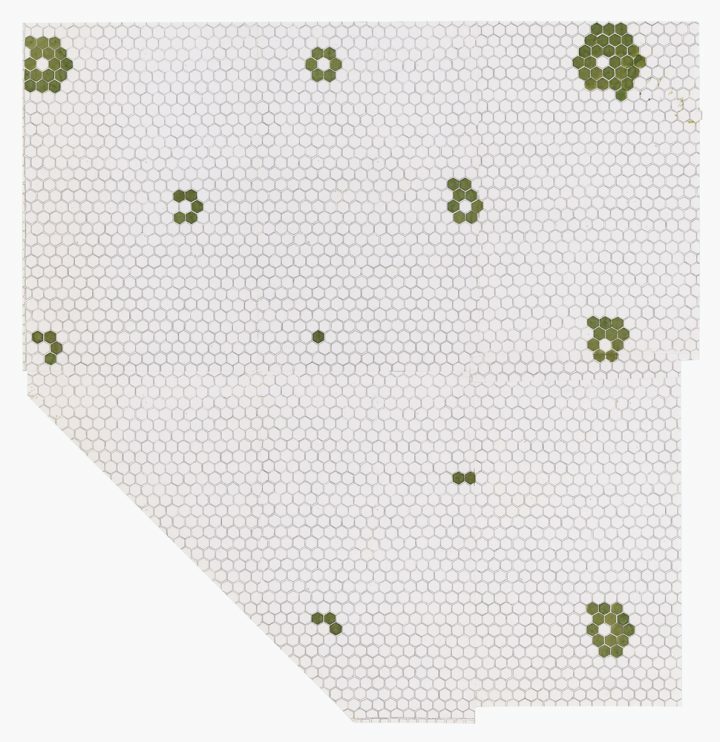 Beginning with a field of white hexagons, she created ‘florets’ by choosing one tile to be left unpainted while incrementally coloring the hexagons around it into an asymmetrical ‘flower.’ In the process, she seems to be trying to figure out which algorithm of colored vis-à-vis white tiles she is going to use determine the spacing of the “flowers” in her installation. In that Empire, the craft of Cartography attained such Perfection that the Map of a Single province covered the space of an entire City, and the Map of the Empire itself an entire Province. In the course of Time, these Extensive maps were found somehow wanting, and so the College of Cartographers evolved a Map of the Empire that was of the same Scale as the Empire and that coincided with it point for point. Borges was interested in the gap between reality and representation. As exact as Fish’s works (maps) are, they never become literal. That’s why I keep returning to them. For all of her devotion to accuracy and precision, something happens between eye, hand, and surface. 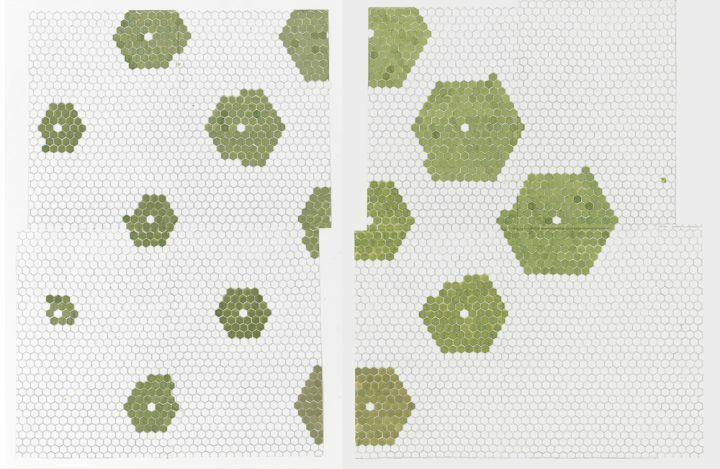 In these works, the meticulously cut sheets speak to the artist’s attention to the ordinary and the little noticed. The original tiles were laid on the floor in an arrangement meant to fit within a built structure; those who walked across the floor were not supposed to notice the tiles’ imperfections. Fish’s notched and shaped drawings brought those imperfections to the fore. Fish seems to want to see it all — she wants to become what Ralph Waldo Emerson called “a transparent eye-ball” who declares, “I am nothing; I see all.” By adapting her printed sheets to include the jagged edges of tiles that were made to fit into the room’s rigid boundaries, Fish recognizes that she doesn’t see all. 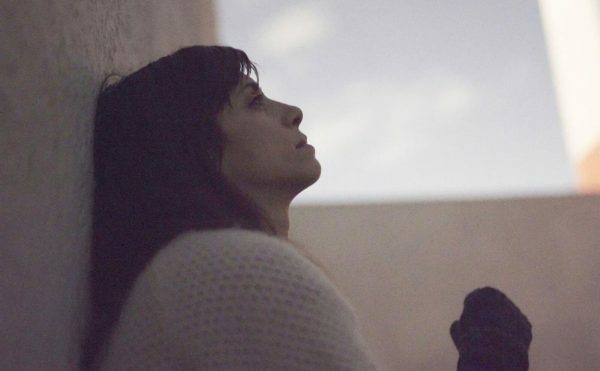 What she does see is the changing light of this swiftly turning world, and those places of seeming stillness where we might walk, not noting what is beneath our feet. Julia Fish: floret continues at David Nolan (527 West 29th Street, Chelsea, Manhattan) through February 18.